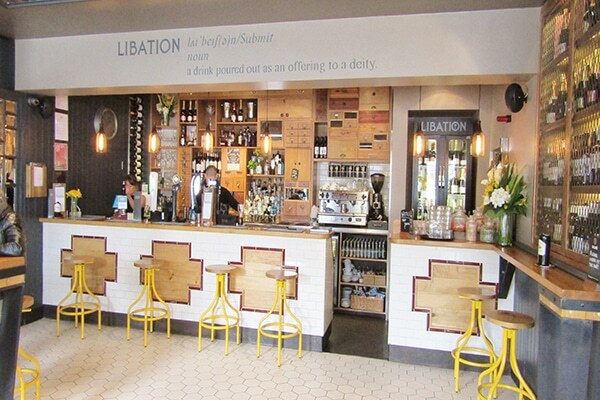 Located a stone’s throw from the sea, on Second Avenue in Hove is Libation, a modern, stylish new bar and eatery. 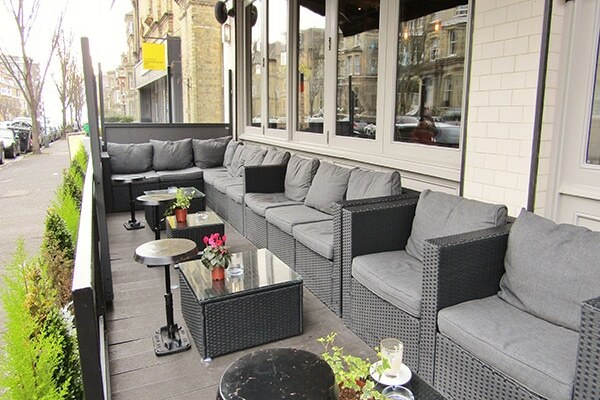 There is super comfy outdoor seating for those warm summer months and inside is a clean-lined combination of warm wood floors and furniture, on-trend dark grey paintwork, with modern industrial lighting and contrast white tiling. 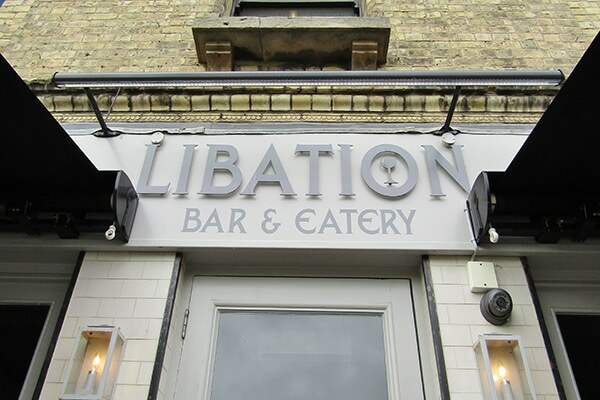 As you walk in you find yourself in the large spacious bar and on either side, there are separate dining areas, which lend themselves perfectly to private functions. 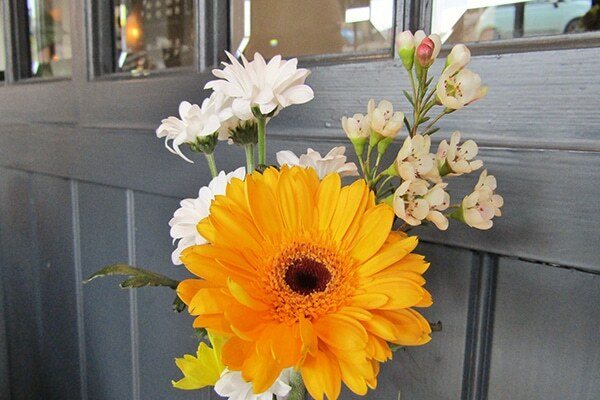 The large windows allow light to flood in and fresh flowers add vibrant bursts of colour. The day we visited they were fully booked with one of the side areas taken up by a birthday gathering and the other seating small groups of hungry diners. 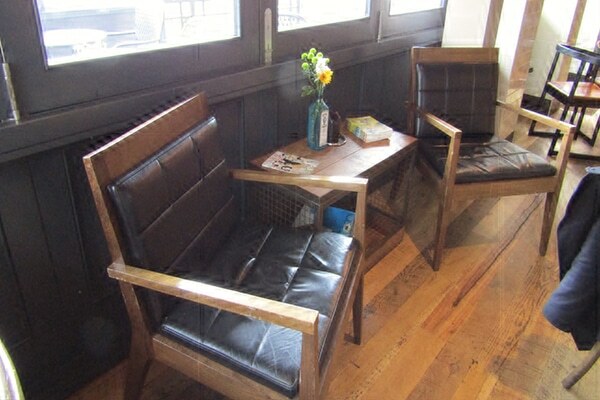 We were swiftly seated at a cosy table for two and presented with the menus. Starters were in the form of tapas dishes and we opted for the calamari fritters with garlic mayonnaise and the breaded deep-fried halloumi with cranberry sauce. They arrived in traditional tapas bowls on a little wooden tray placed in the centre of the table, which lent itself to sharing, which was great as both dishes were very rich. The food was nice and hot and very tasty. 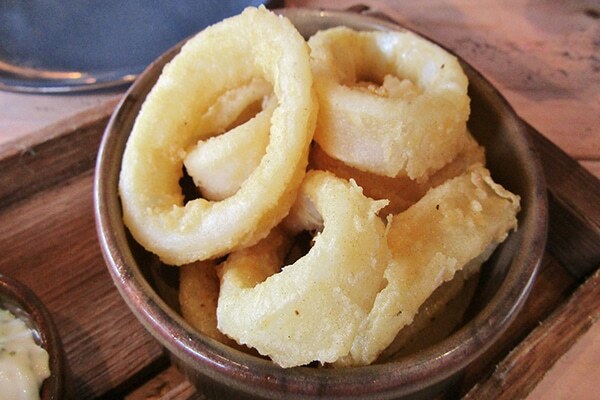 The calamari rings were just cooked, so they were still nice and soft and not at all rubbery. They were coated in a very light, crispy batter, lovely dipped in the yummy accompanying garlic mayonnaise. 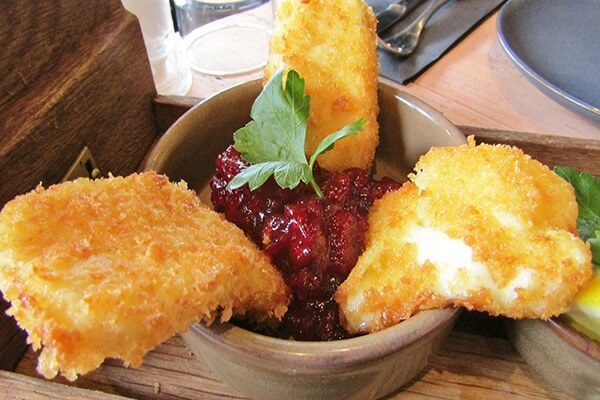 The soft, decadent, salty halloumi was coated in crispy, golden breadcrumbs and served with a huge, great dollop of sweet, tangy cranberry sauce. Once our plates had been cleared the waiter asked us if we were ready for our next course, a nice touch giving us the opportunity to request a bit of a breather. We were not forgotten though, as he checked back in with us after a suitable pause and we were able to give him the go ahead and have our mains when we were good and ready. For the main event, my guest had the pork belly with crackling and I decided to try the lamb, as I so rarely have it. 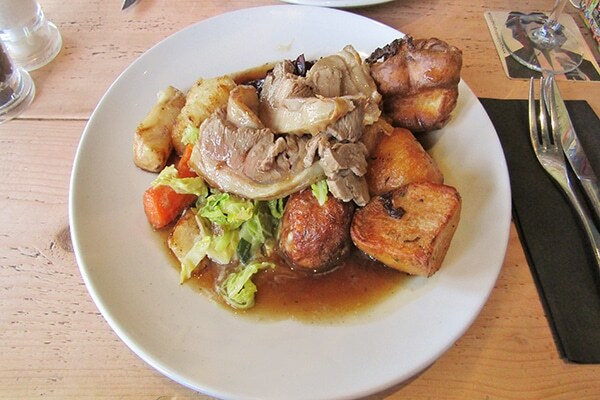 There were no vegetarian options in the Sunday roast section of the menu but most of the tapas dishes were vegetarian and the general section featured a couple of vegetarian options, including a stuffed roast baby pumpkin dish and a goat’s cheese, pesto and sundried tomato baguette. Our meals arrive on spotless, hot plates and the portions were incredibly generous. We were offered sauces and chose mint sauce for the lamb, apple sauce for the pork and horseradish because you can’t beat it with roast veggies. We were brought full size jars of Colman’s sauces, much to my guests delight, as he is endlessly frustrated by restaurants who serve you but a thimbleful of condiment. I got a huge amount of delicious, generously-sliced lamb, none of this thin slivers nonsense, and it was absolutely lush and melt-in-the-mouth tender, perfect slathered in as much mint sauce as I could possibly desire. 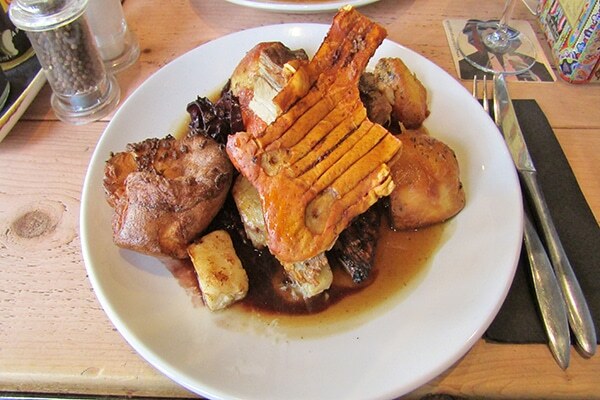 My guest’s pork belly was equally succulent and topped with the largest slab of salty, brittle crackling I have ever seen! We also got a great variety of vegetables, including a generous number of large, perfectly-cooked, crispy roast spuds, two types of cabbage (sweet, tangy, lightly-spiced and pickled, shredded red cabbage as well as lovely, fresh green cabbage, in my opinion a seriously under-appreciated veg) and meltingly soft, utterly scrummy roast parsnips and carrots. We also each got a crispy Yorkshire pudding, a nice bonus if you only expect one with roast beef, and lashings of glossy gravy. It was all very tasty and very well-seasoned. I am ashamed to say that, with the best will in the world, I was unable to clean my plate but I gave it my very best effort. Sadly, however, there was no room for pudding, which was a crying shame as they all sounded fab. We could have had sticky toffee pudding, apple crumble or my absolute favourite – dark chocolate cheesecake. Next time I will definitely forego the starter to ensure I have room for dessert! The service throughout was friendly and attentive and they didn’t baulk when I asked for my leftover pork fat to be wrapped up so I could take it home for our dogs. 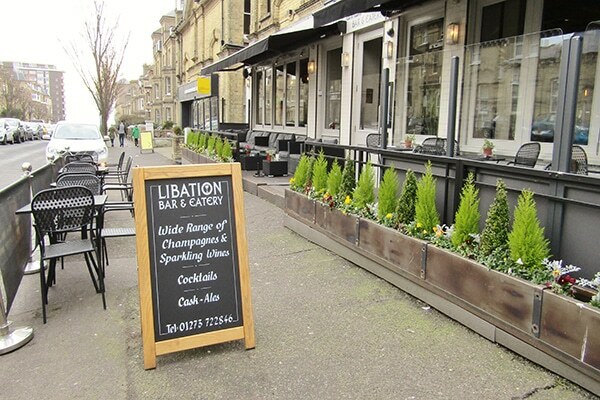 So, if you fancy a little sea air and an invigorating stroll along the promenade, followed by a hearty Sunday lunch, you can’t go far wrong at Libation, though I would strongly advise that you plan ahead and book in advance to avoid disappointment. There is plenty of metered parking nearby and we were able to park directly outside.